Clarence Reid must surely have been the busiest musician in Miami in the 60s and 70s - not just writing but producing and performing as well. And not just performing under his own name but as the x-rated Blowfly as well, from whose adult pastiches of current soul hits he may well have derived more income than from most other source. But amongst a career full of the highest quality songwriting there are always new gems to discover - like this one from female group Midnight Magic co-written by his old buddies Willie Clarke and Freddy Stonewall. From the sobbing opening to the similar conclusion When My Love Comes Down runs full circle via the wonderful lead singer who comes over full of emotional pain and loss. The repeating refrain of the twin flutes really works well as does the stop-go rhythm and the finely judged tenor sax solo. Since I first heard this quite recently I haven't been able to get it out of my head. Sheer class - especially for 1977. 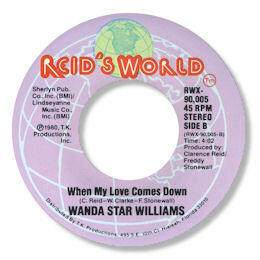 UPDATE ~ Barry Martin has kindly drawn my wayward attention to the version of "When My Love Comes Down" by Wanda Star Williams on Reid's World 9005 from 1980. This uses a slightly remixed rhythm tracks and a slightly less dramatic vocal by Wanda - there is less "sobbing". 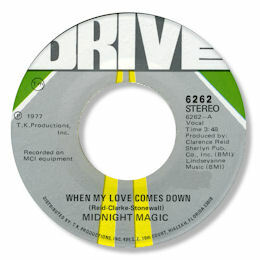 Her treatmant of the song is remarkably similar to the Midnight Magic's lead singer - could this have been Wanda as well? Thanks to my friend Matt Starr for finding this one. And to Barry Martin for the reminder.